What is a Scopist? How to Make Money Scoping. Sometimes you hear a word and your not sure exactly what it is. That’s what it was for me when I heard the word “scopist” I wasn’t sure exactly what it was. Luckily I was able to get a good description from Linda on what a scopist is and what a scopist does. She’s been a scopist for several years and it’s another great way to earn money. 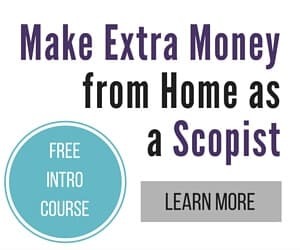 The nice thing about becoming a scopist is that you can learn at your own pace, and start earning money quicker than going to school for several years. In my interview with Linda we talk all about scoping, another great work at home option. What is it scoping ? Scoping is transcript editing for court reporters. A scopist reads each transcript word for word to make sure every detail is correct. This includes punctuation, paragraphing, and formatting. It even means researching proper spellings of people’s names, company names, and medical terminology. The goal is to give the court reporter a perfect transcript. Sometimes the transcript is a boring accountant, sometimes it’s medical malpractice, sometimes it’s a juicy divorce! Regardless, since these are legal documents, accuracy is very important. Having the proper training as a scopist is essential to make sure the transcripts are perfect, regardless of the subject. Who makes a good scopist? People who love language make great scopists. Take me, for example: I was always really good at English and correspondingly horrid at math. Scoping fits me perfectly! Folks who enjoy crossword puzzles and word games, voracious readers, writers – these are signs of someone who would probably be a good scopist and really enjoy the work as well. What qualities do good scopists have? A great scopist is self-disciplined; can sit at a computer for hours and concentrate on the work in front of them; can be given a deadline and will do what it takes to meet it; will go the extra mile when necessary to do the best possible job; who sees themselves as a “reporter supporter” and will be a part of the team that produces a high-quality, timely transcript. How long does it take to learn how to be a scopist? If a student can dedicate 15-20 hours/week, the training takes six months or less. This assumes the student is probably working full time. If not, and the student can spend considerably more time studying per week, that time can be shortened by as much as half! Contrast that to the four to five years it takes to get a college degree to make about the same money, and the timeframe is pretty short! What are the tools someone needs to get started scoping? A scopist needs thorough training that includes punctuation/grammar; learning to read stenographic shorthand; medical terminology; how to put a transcript together according to client preferences; knowing how to run the court-reporting software efficiently; a lot of practice on real files; knowing the ins and outs of being an independent-contractor scopist, including ethics, ergonomics, terminology, marketing, and finding clients. In addition, a scopist needs a relatively current computer, the court-reporting software that is used for scoping, and a word-processing program such as Word. While most information scopists need to look up can be found on the Internet, some resource books are helpful to have as well. How much can a scopist expect to make right after graduating? A new scopist may only make $1,000 per month working with one client and learning the ropes before gradually adding more. It takes a while to build clientele, but it also takes time to build speed at editing. New scopists may also start out working with some not-so-great writers and need to work their way up to some better writers whose work requires less editing, and therefore takes less time to edit. Since scopists are paid by the page, better writers equal a better hourly wage. How flexible of a schedule is it? Is this a part-time job, or is it something that has to be done full time? Scoping is a great part-time or full-time career. Scopists can work a couple days a week with one reporter, or they can work with several reporters and work full time. Graduates should get to know their peers and have someone who can back them up when they get swamped or want to take time off. This allows the scopist a lot more freedom – and who doesn’t like that? How does the business side of it work? A scopist is responsible for finding their own clients. However, Internet Scoping School teaches a through section on marketing, so graduates do well at finding clients and making successful businesses for themselves. Scopists work as independent contractors, so they are responsible for taking their own taxes out of their earnings. But since we own our own businesses, we can write off such things as office equipment, part of our utilities and internet connections, and many other expenses. What is the job process like for a scopist? A reporter takes a deposition or court proceeding which is translated into English on their computer or writer. The reporter will usually input some of the proper names and other terms and maybe clean the file up a bit, then sends the file to a scopist to edit. The scopist does a careful word-for-word edit, then returns the file to the reporter for proofreading. From there it is sent to the attorneys to use in constructing their cases. Once a scopist gets experience, how much can they make? Once a scopist has some speed and experience and gets into the expedited market, they can make double or more per page on transcripts. For example, my regular page rate is $1.00 per page. When I do an immediate copy, where the transcript is given to the attorneys the same day as the proceedings, I charge $2.50 per page. Nice, huh? Although most of the work is regular turnaround, even a few rush jobs can increase a scopist’s income dramatically. They are high stress and exhausting, so it’s probably a good thing we don’t do them on a daily basis. 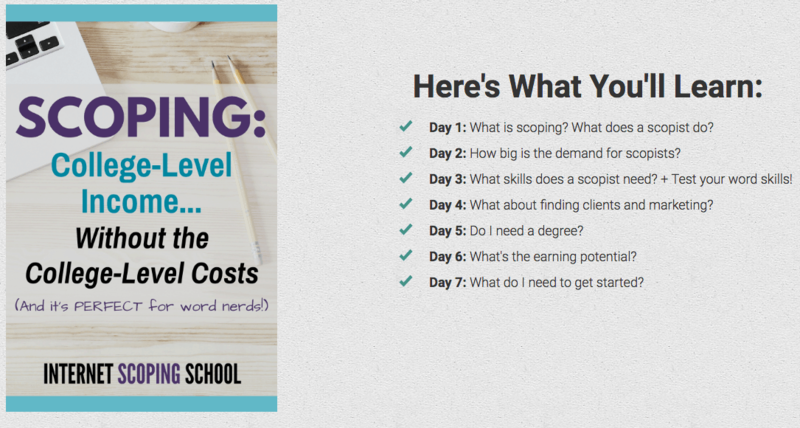 If scoping sounds like something you might be interested in, go to to www.scopeschool.com for more information. Internet Scoping School (ISS) has been in operation since 1999 and is the most thorough scopist course available. Our scopists have the reputation of being some of the best in the business and they’ve earned it. If you enjoy language and want to work from home, it may be just what you are looking for! I have checked out their program and it looks really good for people that are interested in this type of work. You probably have a lot of questions about becoming a scopist. I would recommend signing up for their 7 free mini course.